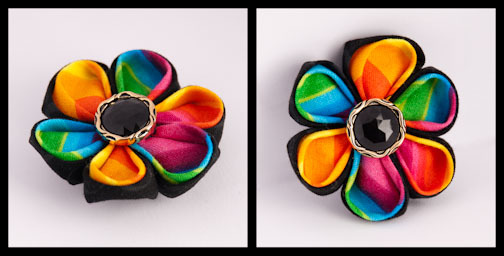 The Kanzashi flowers that we make from everyday cottons are great for casual and formal wear, since they’re elegant enough to spice up your favorite dress, and fun enough to be worn with jeans. Of course, we’re a dancing duet of crafters, so we love to wear them when dancing! These flowers make great hair accessories to place with your favorite costume, and we can do so many color combinations! While we do have our standard flowers that we offer made from fabrics and items that we can find at any time, we can also create custom, one of a kind pieces just for you! If you have a certain color combination you’d like, let us know! We’ll do what we can! And of course, there are many different folds available to stylize the flowers even more. Ask us about them! Our Kanzashi flowers follow the teachings of Tsumami Kanzashi, which is to fold a 2D object into a 3D object, but these are not traditional Kanzashi flowers like one would see a maiko or geisha wearing. Traditional Tsumami Kanzashi is done with the finest of silk and rice glue. Currently, there are only five recognized professional Tsumami Kanzashi artisans, and we definitely are not any of them. Still, we love what we’re doing and we hope that you do too!